Growing up, volunteering was something I saw as very much part of normal everyday life. My Dad was heavily involved with St. Vincent de Paul, while my mother and a group of her friends opened and ran a Gorta charity shop in Carlow town. In addition, my parents were habitually involved with charity events and activities – anything from flag days to coffee mornings. My five siblings and I were encouraged to find causes that we believed in and support them in a similar, if more modest, fashion. Throughout school and college, I was involved in numerous initiatives: running a student chapter of Amnesty International, being a volunteer leader in summer camps for low-income families, carol singing at Christmas, participating in sponsored fasts, walks, runs, you name it. After graduating, I moved to Galway to work with global software giant, SAP, and quickly got involved in their corporate social responsibility (CSR) programme. During my five-year stint there, I volunteered with Junior Achievement Ireland, teaching local school children basic principles of business and the working world. I also took part in Ability West’s ‘befriending’ programme. I was paired up with an amazing girl with Down Syndrome who I met on a weekly basis for over three years to go to the cinema, concerts, shopping, bowling, or whatever tickled her fancy. I started my entrepreneurial journey in 2011. I decided to leverage my skill-set of information development, instructional design, and people management, to establish TWi, offering technical communication services on an outsource basis to large multinational companies. Inevitably, the first few years in this new venture involved long hours, and greatly reduced the time I had for extracurricular activities. Luckily, I had incredible support. Having relocated to Cork, I benefited from the guidance of the local business community through networks such as it@cork and Cork Chamber. I availed of training, mentoring, and practical assistance from the Rubicon Centre, CIT’s business incubation centre, where our offices were located for the first couple of years. I was, and remain, incredibly grateful to the individuals who volunteered their time and skills to help me get things started on the right foot. Initially, TWi had no formal CSR programme as such, although I knew I wanted to incorporate it into the company’s ethos from the outset. Obviously, a start-up doesn’t have the same resources to commit to CSR activities as a huge multinational. However, it is entirely possible to start small. We committed to donate a portion of the company’s annual profits to charity. We began with ad hoc donations or sponsorships, and voluntary engagement in local activities such as entering a relay team in the Cork City Marathon. In 2015, we set up an internal Charity and Community Involvement (CCI) group to put more structure around our CSR strategy. This group is charged with combining the available resources of the company with the time of willing employees, and collaborating with charity partners to deploy them to maximum effect. 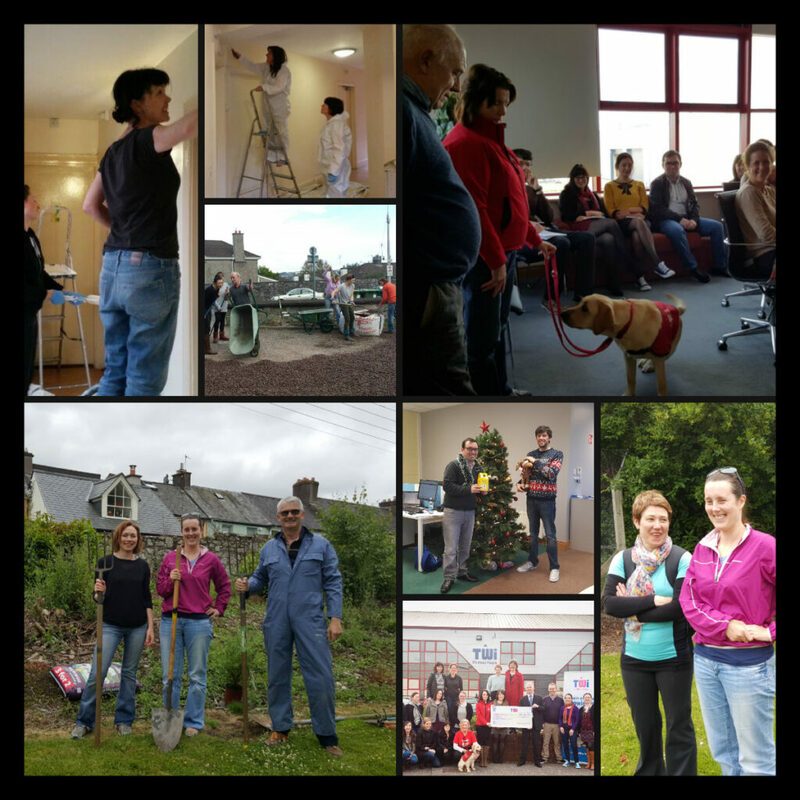 Following consultation with our own staff and meetings with various charities, our 2015-2016 CSR plan focused our support on Autism Assistance Dogs Ireland (AADI) and Cork Simon. In 2017, we continue to support Cork Simon, along with a new charity partner, Pieta House, offering both financial and non-financial support. Our business is focused on creating instructional text for companies that develop technology, medical devices, and pharmaceutical products. We also train people to write business documentation in a clear and user-friendly way. We have proactively shared our expertise with Cork Simon staff through ‘skill-based volunteering’, making use of our core professional skills (writing, editing, and proofreading) to improve the quality of Cork Simon reports and funding applications, and to simplify user manuals for software used by Cork Simon staff. By integrating volunteering and CSR activities into our company’s culture, our collective contribution has far exceeded what any individual could have achieved independently. From a team-building perspective, we’ve gotten back as much or more than we’ve given in effort to complete any task. Furthermore, it’s been a learning curve for all of us. For example, a presentation from a Cork Simon case worker last year illuminated the factors that contribute to homelessness. It gave us a deeper understanding of the issue and challenged some of our assumptions. Certainly, volunteering must be freely given – integrating it into our working lives is not about making it obligatory, but simply encouraging it and making it more convenient. All of us have many competing demands on our time, juggling work and family life. It can be valuable to highlight and facilitate tangible opportunities for staff, along with any willing friends or family, to get involved in volunteering, whether through a company CSR programme like we have at TWi or through an organisation like Volunteer Ireland. Life is full of surprises and none of us know when we might experience challenges and require assistance. In my experience, volunteering can be immensely rewarding and have far-reaching and positive effects, regardless of our circumstances and whether we’re on the giving or receiving side. You article is very inspiring. Thank you for your honesty.